My parents were driving us from Miami to Bridgeport Conn. in summer of 1942 along A1A in Florida…..we stopped the car to look at three sunken tankers miles apart. And not too far from shore….a ten year old kid saw war for the first time….and it frightened me. 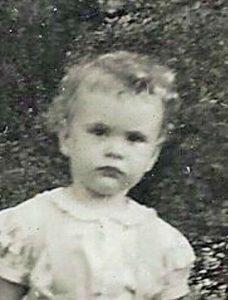 I am sending a picture made in 1943…..taken at the time of my father’s funeral…..My oldest brother John was in The Army Air Force. He later flew P51s out of England and is credited with destroying three German planes. My brother Phil was 13 and my younger brother Tommy was 9. I was 11 and am standing between my two younger brothers. This is the only picture I could find about this time period. The 1930s were challenging years for my Mother and Father, they were beginning to recover from the depression. We lived in an attached house, or row of attached houses in Jackson Heights, on Long Island, NY. Standing on the front steps we could see the passengers looking out the windows as their DC-3 airliners were landing at La Guardia Airport. Mother said she could see the ladies putting on their make-up. One day, shortly before Christmas, Mother was taking me into “the city” (as they called New York). It was snowing as we walked to the subway. While passing one row house, the family was moving their furniture out on the front lawn. It bothered me, and I asked my Mother why they we doing that on a snowy day. She bent down and whispered. “They didn’t pay their rent and they are being evicted from their home.” This really upset me. What would happen to these people? Could that happen to us? This was my first touch with life’s realities. And there was nothing I could do to help this family, or my own. On a Sunday afternoon I was allowed to play with my lead soldiers in the living room. There was an artificial fire place where I was positioning my troops among the logs. Mother and Dad were sitting with my sister listening to the radio. It was a wonderful feeling to be with them and have my favorite toys, too. My father at 40, married with two children, was not an immediate candidate for the draft. However, he tried to join the Navy offering his experience planning the loading of cargo, which was what he did for American Steel Export Company. But, the Navy physical revealed a heart murmur, so he tried the Army (who ran their own supply corps freighters). It looked like the Army would take Dad, so our row house was sold and we sat up all night on a train called “The Silver Meteor” going to Miami. Dad rented an Apartment over a garage on Lincoln Avenue and we awaited his orders. All the major hotels were taken over by the Army. I was thrilled to see real live soldiers marching in the street, calling out cadence. This went on all day, and the golf courses had them drilling with rifles. However, I was disappointed that they were not firing them. On rare occasions we went out to diner where the grownups raved about Florida red snapper followed by key lime pie. The best part was I did not have to go to school, but after a couple of months the Army discovered Dad’s heart problem, and turned him down. So, back we went to Long Island, but this time to Centerport, a village about 60 miles from NYC. Dad commuted leaving at 6:00 AM (returning about 7:00 PM) daily planning cargo loads for the same company he worked for earlier, but now his customer was Uncle Sam. We followed the War with maps in the newspapers the Allied and Axis forces struggle. Several of Dad’s business friends were caught up in the fall of Shanghai, Singapore, and Hong Kong. There was bad news all over the world. London was being bombed and the news reels show fires and buildings toppling down. Germany was advancing all over the world, even in North Africa. Japan captured the Philippines and we heard terrible stories about the “Bataan Death March”. Then there was a wonderful event shown on the movie theater newsreels. U.S. Army bombers could be seen staggering into the air, taking off our Navy’s aircraft carrier Hornet….Jimmy Doolittle thrilled the world leading an attack bombing Tokyo ! Months later Dad received Capt. Ted Lawson’s Book of the Month Club selection “Thirty Seconds over Tokyo”. I still have it. Next, came the jungle war in Guadalcanal. A high school class mate of my sister’s was wounded there, and was shipped home in time for his graduation. When the Battle of Midway took place the newsreels showed the carries and their aircraft in exciting action. For me, and my friends, this was more than “visual history”, it was the “wild west” at sea. We learned the names of our carriers. During any free time in school we would draw airplanes firing on the enemy aircraft and ships. We used rulers to draw strait lines of our fire. Eventually, the big day arrived. People went to church to pray for the troops landing on “D Day” the 6th of June 1944. The news reels of the landings were frightening, and the death on the beach was very real. But the day by day advance of the Allied Forces appeared on the front page of newspapers. Victory in Europe seemed to be on the way. The Pacific War featured island hopping invasions with Marines storming ashore under deadly fire. Despite heavy naval bombardments, the resistance was heavy and the losses were terrible. Flame throwers made war look horrible, but we had to win. Then one night our family went to the movies to see the first newsreel of the Atomic Bomb dropped on Hiroshima. That was shocking, but it made the war end, and everyone we knew was thrilled. I recall my father and grandfather discussing the bombing of Pearl Harbor in December 1941, but at four years of age I did not comprehend the significance of it. Being so far inland, we were never subject to black outs and, although the town siren sounded every day at noon, I do not recall any air raid drills such as I have read about in major cities. My parents started saving tinfoil and I can remember peeling it off of chewing gum wrappers, and some candy wrappers. A sign was erected in a small park on Main Street that listed the names of the men that were in service. My mother and my grandmother had large “Victory Gardens,” but the change was lost on me as we had always had pretty big vegetable gardens. I recall discussions about rationing and my parents using honey rather than sugar as a sweetener in their coffee. The USAAF built an airfield outside of Casper, Wyoming, about 25 miles west of my hometown. It opened in late 1942 and trained crews for both B24s and B17s. A part of that facility was a target range for practice bombing and gunnery. That range was located about 15 miles north of my hometown in a scrub brush, sand hill area. As a result, men in uniform and Army vehicles became a common sight in our little town. The range crews drove back and forth from the air base and the range every day, and became regulars at the local establishments such as the bars, the lone movie theater and grocery stores. A few even became overnight guests in the one cell city jail. I recall my dad taking me to a crash site near the bombing range and seeing the wreckage of the airplane. There was an USO Canteen in Casper and many of the young women from our town went to entertain at that Canteen. That is where my aunt met her husband to be. It was probably late 1943 or early 1944 as he had completed his required combat missions as a tail gunner in B24 Liberators in North Africa. He was assigned to the Casper USAAF Airfield as a gunnery instructor. Shortly after he and my aunt started dating, he incurred lung damage from an inflight fire during one of the training missions. The damage was severe enough that in 1944 he was medically discharged and he and my aunt were married. I read with interest all the descriptions of the differences in our lives from then and now. I was born in 1946 and did live in an all-family focused family. I can remember when I was in my late teens, I came home from being out and about, and my parents were not home. It seemed a crucial blow, even though they were simply at my grandparents’ house playing cards! But to me it was my very first realization that they had a life separate from me. That’s how safe I had always felt. Yes, the cold war was always hanging over us back then, but today’s burdens – the fear of terrorism and the sense of societal decay – seem to be much more overwhelming. I grew up in he 50’s and attended St. Brenden’s Grammar school in the Bronx, N.Y.from 1949 until we left for the suburbs of N.J. in 1959. I remember wearing dog tags and having practice air-raid drills and by being “protected” under my desk from a Russian nuclear attack. I also remember a much safer time, earlier, right after the war, when I was able to walk home from St. Brenden’s for 6 blocks by myself, before my mother would meet me at the corner of Decatur Ave. and Gun Hill Road. I was only 5 and in kindergarten the first year. Even as a six-year-old, I could sense the change in my parents. I understood my own anxiety. The move from Baldwin Park to Chico had toppled my entire world. But grownups were not supposed to have those feelings. I could only hope that our life would somehow get back to normal. I did not have long to wait. My dad was a very resourceful man. When the stock market crashed in 1929, he had just turned seventeen. He entered adulthood during very trying times. He was a product of the Great Depression. His parents were schoolteachers. Thus, education was paramount in their lives. Dad tried to keep peace in the family by remaining in school. But money was short and he was of an independent nature. For the next seven years until he was 24, he alternated between academic pursuits at Northern Arizona State College in Flagstaff and Arizona State College in Tempe, and the “school of hard knocks”; riding the rails and living in hobo jungles throughout the United States. He learned at an early age to be “quick on his feet.” Survival required it. The free life ended in 1936 when he married my mom. They were married on the first of June shortly after Mom graduated from high school. I was born nine months later on March 24. Dad was now a family man. Dad was up to the task. With the help of my grandparents, he bought a lot in Baldwin Park, California and built a home for us. 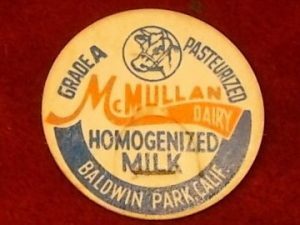 He went to work for McMullan’s Dairy milking cows. He worked his way up to foreman and we moved into the foreman’s quarters on the dairy. My mom helped out in the little store where they sold the dairy products they produced. Despite the war, their life seemed secure. Many young men of Carmel, as was true across the U.S., joined the military before the outbreak of the war, realizing the country’s involvement was inevitable. My brother Carlyle, 18 years my senior, enlisted in the U.S. Army Air Corps in January, 1941. 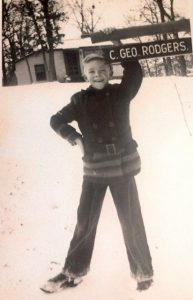 My 7-year-old mind, then, was focused on his activities as he progressed through advanced photographic school at Lowry Field in Colorado to become a Staff Sergeant and gunner/photographer. 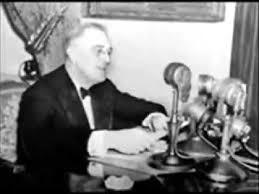 Pearl Harbor brought us into the war, and I was proud of Carlyle and confident our country would prevail. 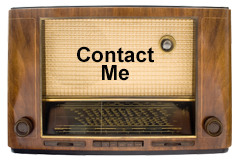 I listened intently to nightly news, tracing the war in Europe and the Pacific, read newspapers to follow our troops’ movements and kept a list of the dozens of war correspondents. The progress of the war was a constant conversation in our home. In my young mind, there was no possibility we would lose the war. I earned a nickel every time I brought a letter from my brother from the post office. And I was encouraged to write to all my uncles and cousins who were in the service via V-mail (Victory-mail). I wrote each letter on a special stationery sheet, which folded to form its own envelope. These letters, then, were censored, put on film, and sent to their overseas destination, a method that conserved space in transporting them, then printed again to deliver. 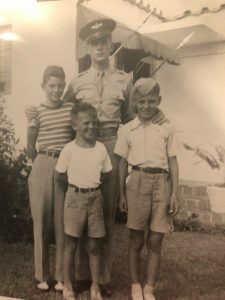 I learned that servicemen didn’t want serious news, and filled my letters with details of everyday events in the family’s life and happenings in Carmel. Family members served on both fronts. I lost a cousin on Omaha Beach, another, a paratrooper, was wounded shortly after. One lost his life at Pearl Harbor. My uncle, the oldest in the family to serve, fought to capture South Pacific islands from the Japanese. The youngest cousin to serve was a Seabee, building airfields on those islands as we won them. A lot of emotion for a youngster, but I remember feeling immensely proud, and confident we were doing what we had to do to secure peace. 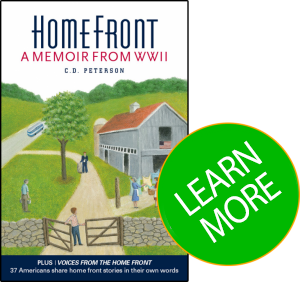 As World War II wore on, life on the home front became increasingly chaotic. Everything was in short supply. Ration stamps came into being. The “black market” raised its ugly head. Outside forces were taking over people’s lives. Unwelcome regimentation was extending from the military down into the civilian population. The magician we call memory has many tricks up its sleeve. Trivial things often stand out ahead of major events. Its slight of hand hides some experiences and makes clear others. Perhaps we choose what we remember; perhaps what we remember chooses us. As a first-born son and grandson, love and security surrounded me. A doting grandmother watched over me while my mom went to business school. Three aunts, age 17, 19, and 21 the year I was born, spoiled me. My world was safe. I remember bits and pieces. Aunt Sue’s idea of babysitting was to strap me in the front seat of a Piper Cub and fly around Southern California as she built up flight hours. She let me take hold of the stick and bank and turn and climb and dive. At least I thought I was in control. I loved it. Aunt Fran had married and her father-in-law lived with them. He had a handcart he pushed around the neighborhood selling fruit and vegetables door to door. I delighted in tagging along as his “helper.” Aunt Rae was busy with nursing school but always had time for a hug and a kiss for Bobby. How can I remember so much? 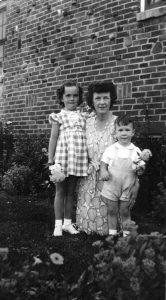 I was born in 1940 in Newark and then moved to Union where the memories of the war click in. How can I remember so much? The dark green light blocking shades. Daddy’s head lights half blocked. The running board and rumble seat. The excitement in the streets on VE and VJ day. Saving the ‘tinfoil’ from gum wrappers. Mom giving me twenty five cents to walk to the store (Heavens, she’d be in jail today) for a few slices of bologna. Johnny ride a pony – hide and seek – kick the can – sleigh riding on the street in winter – freedom to roam all over the neighborhood. My first portable radio – looked like a big lunch box. Climbing and falling out of many trees…..guess I was a real tomboy. Oh, and I do remember going to the old, old, Newark airport to mail packages to my Uncle Joe who was a cook (chef) in the Navy in the Pacific. (I still have his hat from 1939.) I remember all the things he brought home….a piece of a Japanese Zero, a hand grenade, a bloody Japanese flag. Wow, as I said I born in 1940. It’s now 2017. That’s a lot of years! 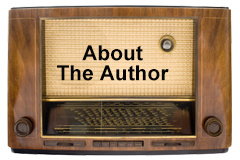 This post introduced our blog in April. 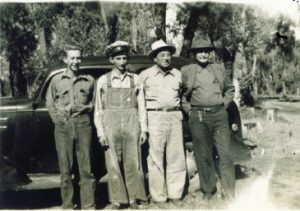 It’s a special post about those who came of age in the 1940s and early 50s, “the Last Ones.” We are the last ones who personally experienced the scarcity of the depression, the patriotism during World War II and the exuberance in that brief, post-war period when we felt safe and when the middle class was born. Your stories are special. Post your stories here. I’ll share them. Born in the 1930s, we exist as a very special age cohort. We are the “last ones.” We are the last, climbing out of the depression, who can remember the winds of war and the war itself with fathers and uncles going off. 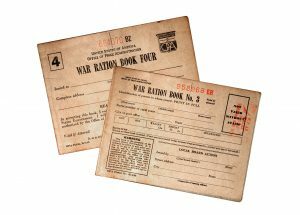 We are the last to remember ration books for everything from sugar to shoes to stoves. We saved tin foil and poured fat into tin cans. We saw cars up on blocks because tires weren’t available. My mother delivered milk in a horse drawn cart. We are the last to hear Roosevelt’s radio assurances and to see gold stars in the front windows of our grieving neighbors. We can also remember the drama of “D Day” and the parades in August 1945; VJ Day. We saw the ‘boys’ home from the war build their cape style houses, pouring the cellar, tar papering it over and living there until they could afford the time and money to build it out.